Mark Hill is a visionary IT leader specialising in innovative technology transformation and strategic business change initiatives. Hill has more than 25 years of experience in delivering complex mission-critical technology across both the Capital Markets and broader Financial Services sectors. He has managed large global teams and multi-£100million programmes. What was your first job? My first ever job was working in a fishing tackle shop when I was 13 years old. I spent every Saturday lugging things around, bagging tackle and sifting through maggots and worms. I constantly smelled like ammonia. As far as the beginnings of my IT career, it really started when I went to Australia after university. When I couldn't get work in a bar, I ended up running Microsoft Word training sessions. I went on to work installing computers and within a few months, I ended up working for Westpac Banking Corporation. Within weeks of joining, I was leading a desktop support team. Did you always want to work in IT? I always liked tech, but my earliest memories are of wanting to be a chef—or a millionaire. I had a ‘career' chart mapped out when I was younger with all my ideas; stockbroker, advertising, the army, and working in IT. It just so happened that this was the 1990s, and I was entering the working world at a time when IT was booming. The rest, as they say, is history. What was your education? Do you hold any certifications? What are they? My degree was in Business and Applied Science. Dedicated computing degrees were not as popular then as they are now, though I did a little computing during my degree. Throughout my career, I've studied a lot of technical and non-technical certifications. However, I've also studied Project Management, Architecture and Service Management, which have all been really useful. Explain your career path. Did you take any detours? If so, discuss. I sort of fell into IT. It was really a case of great timing; the opportunities were there when I was starting out so I took them because I'd always been interested in tech. It felt quite natural to me. I picked things up quickly. I was in charge of people from pretty much day one in my career, so I got a lot of management and leadership experience at a relatively young age. This helped accelerated my career and kept me focused in the tech sector; opportunities to advance kept presenting themselves so I took them. I don't believe I was ever a pure techie. I was technically strong and have always prided myself on my ability to understanding the practical, technical aspects of IT, however I also had solid communication skills and a good grasp of business and operational requirements. This combination probably helped me to rise quickly through the ranks in IT. For a long time I felt like I didn't have a "career", as it was something I'd stumbled upon, rather than planned for. Although I was earning good money, I wasn't sure if I was doing the right thing. In reality, I had a fantastic career—I enjoyed experiences and successes that many people would kill for, it just took a while to realise it. These achievements haven't come for free, though. It's been extremely hard work; long hours, high pressure, and some failures mixed in with hopefully a lot more successes. Ultimately, you get out what you put in! What business or technology initiatives will be most significant in driving IT investments in your organisation in the coming year? Like many firms, we'll be looking into utilising AI to make the job of the recruiter even easier, particularly in helping them to make decisions. There's a lot we can do through platforms like Salesforce, which we've already heavily invested in, but I think it is important to look at other options available in the big clouds like Azure and AWS. Ultimately, it's all about improving top-of-mind awareness of our brands, improving efficiency, and making us more accessible to our customers using an omni-Channel approach. What are the CEO's top priorities for you in the coming year? How do you plan to support the business with IT? Since I joined the business, we've gone through a two-year-long foundational period in which we've worked to dramatically improve our front office, day-to-day operations and general business ‘hygiene'. This year we'll be seeking opportunities to further leverage data insights and automation in the front office. We're proud of our training structure here. We've always believed in hiring enthusiastic people and giving them the tools and skills they need to succeed. We continue to undergo massive organic growth in terms of our headcount, so we're going to be looking at ways we can use technology to direct our sales teams and make sure they have access to the right information at the right time. Being able to offer guidance and help our trainees get on top of their game faster is an absolute business imperative for us. Also, the business has been shifting to become even more customer- and candidate-centric, and we're looking for ways to help our front and back office teams deliver even better service. Anything that allows them to spend more time building better relationships with our candidates and our clients will become a priority. Does the conventional CIO role include responsibilities it should not hold? Should the role have additional responsibilities it does not currently include? 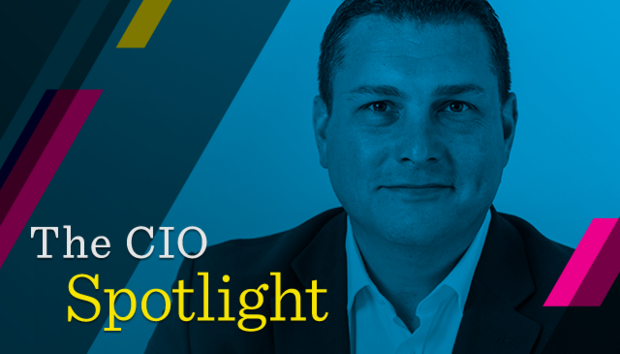 It's impossible to know what a CIO even is anymore, let alone to define what responsibilities they should and should not be shouldering. For me, the CIO is a ‘business' leader that happens to require a more detailed understanding of technology. However, tech-savviness should not be exclusive to the CIO. All modern C-suite executives should have strong commercial understanding of their business and a solid appreciation of technology as well as their own specialism. Tech really is that pivotal to business today. So, when you're talking about the boundaries of the role of a CIO, I think it's something of a moot point. In my CIO role at Frank Recruitment Group, I wear several hats. I manage tech, I oversee data privacy and security, and I run all business change. Business change is something that's not always traditionally the responsibility of the CIO. In reality, business change is a matrix involving lots of stakeholders, but in the modern era so much of it goes hand-in-hand with digital transformation that the bulk of business change execution falls to the CIO. IT is the only department that has an overview that spans all business areas and the vast majority of business processes; tech is the common thread that runs throughout the entire business. In my opinion, this makes the CIO perfectly placed to help execute strategically aligned change and ultimately deliver results. Are you leading a digital transformation? If so, does it emphasise customer experience and revenue growth or operational efficiency? If both, how do you balance the two? It's an ongoing thing; Frank Recruitment Group is on a continuous journey, our digital transformation is very much in progress, and in this day and age, it will never be completely finished. We are in an era of constant innovation—there isn't really a finish line any more, it's about constantly striving to improve and be better than the competition. I believe that customer experience is absolutely core to our success. We're constantly trying to make things better for our customers. This is what drives top-line revenue growth. Operational efficiency is also important, but ultimately there's only so much cost you can take out of a business and, in a growing business, the focus needs to be more on top-line growth. Describe the maturity of your digital business. For example, do you have KPIs to quantify the value of IT? At this stage, we don't have formal KPIs, but we have done a lot to ensure that our internal staff and customers are able to interact with us on a much wider, digital basis, and on any device. Assessing the ongoing performance of our new digital tools and strategy is an area that is work in progress, especially where customer experience is concerned. What does good culture fit look like in your organisation? How do you cultivate it? Culture is massive at Frank Recruitment Group. It's a core part of our DNA. We've worked hard to stay true to the culture that has driven the success of the firm ever since we launched in Newcastle 14 years ago. We're still a young business, we're ambitious, and we have strong values that we're proud of. We're all about entrepreneurialism, opportunity, accountability, tenacity. We wear our culture on our sleeve; all of our employee branding, our training materials, and everything we do is based around demonstrating our core values. We've done a huge amount to underpin the culture of the organisation and mature it. For us it's been about evolution, not revolution. It's about supporting those values where we see them and redirecting or educating the business where we don't. Inclusivity is another massive value for us. We're hugely proud of our diversity. We do business in forty plus countries, we have offices on four continents, and our staff speak countless languages. It's about creating a culture in which everyone can thrive, and we are working hard to diffuse those values throughout the ecosystems we work in by supporting skills programs, diversity initiatives, alternative hiring strategies, and external charities. What roles or skills are you finding (or anticipate) to be the most difficult to fill? Development roles are hard to fill now. There are people with the skills, but the demand is outstripping supply. This is causing a big problem in our core markets. That's why we are operating programs like the Mason Frank Tech Academy, to fill those skills gaps. The Tech Academy takes people with IT experience in other sectors or technologies and cross-trains them into current high demand technologies such as ServiceNow, AWS or Salesforce. We then place them with partners or end users at very reasonable rates. We've been lucky enough to be able to utilise that talent internally also, but there is still work to do to plug that shortage in the job market. Great architects are very tough to find too. Younger generations of workers are good at the technical side of things, but when you're lacking in real-world practise, it's difficult to think about the ‘big picture' and how to leverage these new technologies in a commercially valuable way. Therefore, a solid, experienced architecture who can strategise is, in my opinion, worth their weight in gold. What's the best career advice you ever received? That's a tough one, but a few things spring to mind: "If you're going to sweep the path, sweep it properly"; and "get the details right and the outcomes sort themselves out." These are really relevant to IT in particular, as in IT as it's the details that kill you. So do things properly and think detail. Operating with integrity is also key. There are people out there who are full of ‘hot air', so always strive to do your job with honesty and consistency, keep your word, and put your hands up when things go wrong. That's what people want, and ultimately, they will respect you for it. If you start to be recognised for accomplishing what needs to be done, and you work to sell your strengths, good things will happen. Do you have a succession plan? If so, discuss the importance of and challenges with training up high-performing staff. Succession planning is difficult in a small rapidly growing organisation. Right now, it's not a priority, but I will need to start thinking about succession planning in the next 12 months. People are the number one most important asset in IT. Without them, nothing happens. Leaders, be they technical or strategic, are the most valuable asset to any business and to attract, retain and grow these individuals then you must invest in them. What advice would you give to aspiring IT leaders? One thing that I think is important is creating your own brand, whatever that might be. Always be true to the values you set out to represent as part of your personal brand. You may be seen as a great thinker, or perhaps you always get the job done. Play to your strengths. Whatever it is, characterise it and become known for it, build a reputation among your internal and external network. If you're credible then opportunities will arise for you, and you need to be ready to pounce; they don't always come when you think you want them. As you progress in your career and rise to more senior positions, you'll be delegating a lot of the execution, and you'll be doing more of the strategic thinking. When you're in these positions, looking at the big picture, you need to stay inquisitive. I learn new things every day, both from the junior employees, from my peers and externally; you are never done developing yourself, so take time to reflect and improve. The number one thing to keep in mind is not to give up. You will make mistakes, there will be dark times, you may appear to hit plateaus, but you have to persevere. Continue to display the characteristics that got you this far, and you will keep moving forward. What has been your greatest career achievement? There have been many things throughout my career that have been really rewarding. But I will say I'm really proud to be at Frank Recruitment Group, and I'm proud of what we've achieved since the time I joined in January 2017. We've grown our headcount enormously, we've opened offices in a host of new countries, we're succeeding in new markets. And we've done all this while rolling out a major new CRM system. Our Salesforce CRM project was the largest force.com implementation ever undertaken in Europe, and we pushed it live globally, across seven brands, in the space of four and half months. This involved moving from several legacy platforms, cleansing and migrating data, and training hundreds of users, and we did that without any major issues. The success of that project and our ongoing digital transformation is what led to my being nominated for the CIO of the Year prize at 2018's Tech Leader Awards, which is of course something I am incredibly proud of. Looking back with 20:20 hindsight, what would you have done differently? I believe that you're a product of your experiences; if all of the things I've done and the choices I've made are what have led me to where I am, then ultimately I wouldn't do anything differently. I'm very happy with where I am now. That said, I am not one of these people who will gloss over the rough patches. To sit there and say you wouldn't do anything differently is to say you have never made a mistake, you have never learned from something. That's not true. However, I don't have any major regrets. Everything that has perhaps not gone the way I planned or expected has been a learning experience. What are you reading now? At the moment I'm reading rugby coaching ‘bible' Total Rugby, by famous Scottish International and British Lion Jim Greenwood. He's one of only four rugby coaches in the World Rugby Hall of Fame, even though he never coached an international team. He's one of the game's greatest visionaries—he very much advocates giving people guidance and their own space to grow and become self-reliant. His style of coaching was about getting people to think for themselves; he wanted each player to "be their own coach, to encourage each player to expand their awareness, to find truth wherever it lay." Most people don't know that I… I spent some time in Central America, building housing for the indigenous Lenca people of Honduras, where we constructed huts from mud and other natural materials. The Lenca are Honduras' largest indigenous group, and their communities are centred around traditionally practiced agriculture, growing crops like coffee, cacao, and tobacco. My time with the Lenca was eye-opening. They live with extreme poverty, with no electricity and no running water, but their communities are very tight-knit; everyone is expected to contribute to the maintenance of the group. It really gave me a lesson in what's really important in life and how we take for granted such crucial and basic things like being able to eat. In my spare time, I like to…I try to keep fit, whether that's boxing, training in the gym, or running. I also coach youth rugby and like to cook (even though my chef ambitions never quite panned out), and most importantly I love to spend time with my family. Ask me to do anything but… Do not ask me to just keep the lights on. I am incredibly flexible when it comes to new things. I thrive on change, which is what gets me excited. So do not ask me to keep things ticking over.